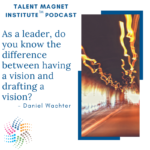 Leaders from all over the world ask often, “how do we achieve our next chapter of success?” Our recommendation is to take all of the necessary steps to become a talent magnet. Becoming a Talent MagnetTM is not easy but worth the investment of time, energy and resources. It is THE way to elevate your business. The leaders who seek winning talent magnet strategies, inspiring ideals and the best tactics that, when implemented, elevate the business and themselves. We hope this post inspires you to take the next big step to elevate your game. In supporting family business, private company, private equity portfolio companies and holding companies, we have seen it all: the best-of and the worst-of talent strategies. The greatest percentage today, unfortunately, still lack strategy. We walk alongside of leaders and businesses as they achieve their next stage of growth, go through successful generational transition– and decide to implement a best-of-class talent strategy … Acquisitions and mergers that once never felt possible but have been ultimately successful … Divestitures that may have taken place 2-3 years too late … Family businesses that are seeking professional leadership … Leaders who are completely burned out and leaders who are completely on fire and leading well … Leaders who are isolated and need the right partners … Leaders who are insulated by the right advisors, board members and colleagues. We have witnessed and experienced teams that ‘row’ together and teams that make you wonder how anything ever gets accomplished … Leaders who fully understand how to lead, motivate, inspire and prepare for the future (succession) … Leaders who do not deserve the title of leader … Executives who deserve more and executives who deserve the door … People who make you better every time you are around them … People who are bold, courageous and inspirational. Centennial serves leaders and businesses from 16 countries as well as across 80% of the United States of America. Leaders frequently ask us what is “best.” They wonder how they can be “the” place where the greatest talent wants to work. Here are some recommendations for best practices. We hope they help you. Furthermore, we can come alongside you to help you and your business by assisting you through the Becoming a Talent MagnetTM solutions to elevate those around you and your organization. This includes a full suite of solutions designed to help positively enhance the employee experience, gain knowledge and elevate your employment brand and ensure you are leading in a way that provides a talent magnet worthy culture. This includes attracting the best, bringing out their best and retaining the best. It also ensures that when talent moves on to their next chapter they remain your best brand ambassadors. 1. Be Intentional. Take the necessary steps to intentionally move yourself, people and business forward. 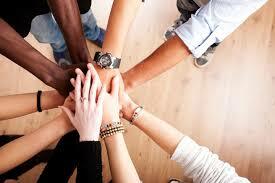 Be intentional in a successful integration of yourself, family, employees, customers and friends. Those who are most successful have learned from personal experience and from others that life matters, work matters and health matters. You matter. Too many have to learn from regrets. Take an active assessment of what you wish or know must change. In some cases you may have to break through the concern that, “it could never change – it is what it is.” This can also include business circumstances, team circumstances or industry circumstances. Stop sitting in the passenger seat or only looking through a rear view mirror. Be intentional and take active control. People are watching you – personally and professionally. Set an example of how to lead versus what to avoid. 2. Stop. Evaluate your Corporate Culture NOW. I have become increasingly convinced that you cannot lead a healthy organization without an external partner to lead your organization through a culture audit. It is the only way to gain active, unfiltered and real-time knowledge of your corporate culture from the inside out. Stop ‘thinking’ you know and begin an active effort to actually know. Organizations that have never completed a culture audit, 360 reviews, employee surveys and stay interviews are light years behind those that lead their industry. I am also convinced that it should be required for a leader to have an active pulse on their culture. Leaders who seek the unfiltered reality are always miles ahead of their competition. Invest actively in knowledge of your corporate culture. At Centennial we call this the Voice of Team (VOT). We believe the VOT is as important as the voice of your customer (VOC). In fact, there is a correlation between the two: the higher your VOT, the higher your VOC. We have seen that the more your internal team members feel valued, appreciated, invested in and engaged, the greater the direct benefit to your external customers, the bottom line and the community in which you operate. Hopefully you and your entire team acknowledge how important your employment brand is to leading and maintaining a great organization. 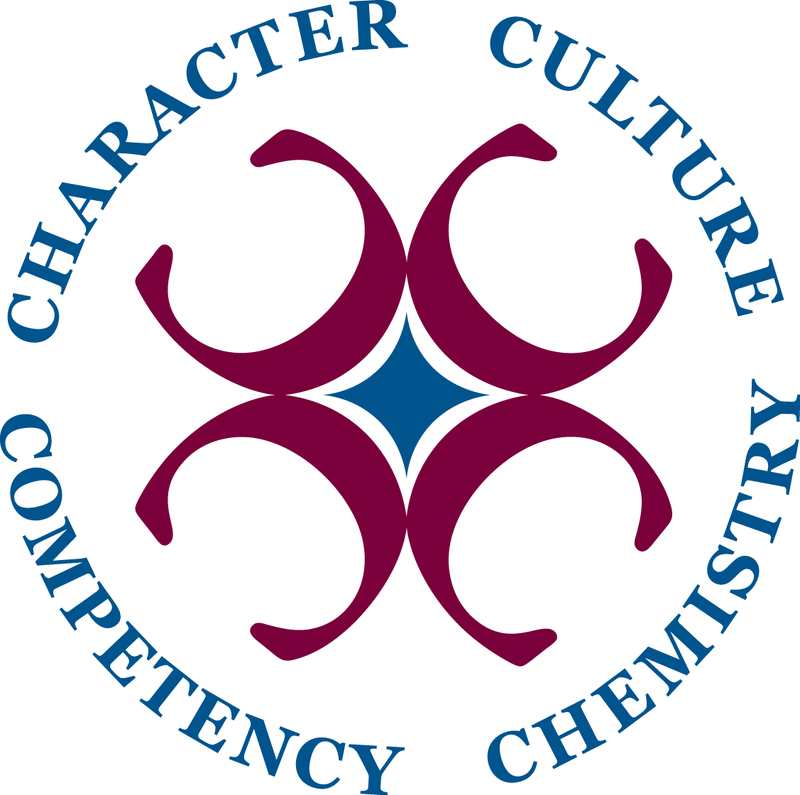 If you follow Centennial, you know how much importance we place on employment branding. We have been advising, consulting and guiding organizations in knowing and enhancing their employment brand for decades. We take a holistic approach in both understanding and taking a proactive approach to effectively managing employment brands. 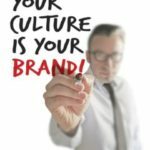 Corporate culture and employment branding must take a front seat in your strategy. How do we know when it is in the right position? It shows up in an organization’s key performance indicators, critical success factors and strategic plan. It is talked about proactively and is the reason why people join, stay and tell their most talented friends about their workplace. It is the reason why great companies gain and retain industry leading customers. It has an active position, budget allocated, full executive buy-in, executive champion, cross-functional team and the real time ability to take the pulse. We have experienced the impact of this done well and also the negative recourse when done poorly. You want to build an effective and efficient talent pipeline? You want to have a successful talent strategy that enables your business strategy to be successful? 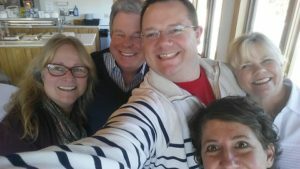 You want to be viewed as an active leader in your community? 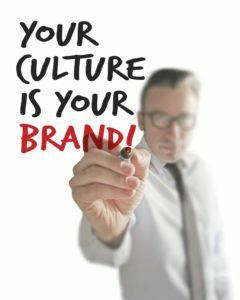 Be intentional and invest financial resources, people resources and time on your corporate culture and employment brand. It has been said that, “your corporate culture shows up when the leader leaves the room.” It is your responsibility to know the full, unfiltered, truth and nothing but the full, unfiltered, truth of your organization’s culture. Let one of our team members help you today in gaining full knowledge and awareness of your corporate culture. Once you have this baseline, you can begin improving and further investing in. You can also begin the process of stop, start and continue to better your company and the people in it. 3. Brand Ambassadors or Brand Detractors? Becoming a Talent Magnet also means that you have an employee brand that is positively supported by those who have left your organization. Whether they left for another opportunity, were managed out of the organization or retired from your organization, they should speak positively of the time spent working with and for you. Alumni can be your greatest brand ambassadors–or greatest detractors. 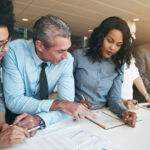 How they felt, were nurtured by and communicated to, during their time with your organization will determine whether they attract or detract talent to your organization. Do your part and make sure the way your organization communicates, manages and leads people builds brand ambassadors for life. 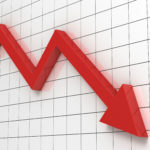 Did you know that 40+% of leaders fail in the first 18 months of their new role? The failure is often due to not having the opportunity to acclimate successfully to what the new role or organization requires. Each interaction people have with your organization matters. This includes each and every person who applies to your company. Onboarding, for those you ultimately hire, starts with their first interaction with you. This means whether they are hired or declined that they leave with an overall positive impression of your organization. We also must invest heavily on managing our communications to applicants. It is almost too easy to overlook this critical point of contact. Do not make the same mistake that your competition may be making. Give yourself an immediate “employment brand boost” by communicating well. The beauty is that this follows through to the full cycle of onboarding. Your onboarding must go before and beyond the first day of employment. You should have a clear road map to onboard. This road map will include specifics prior to start, the first day, week, 30 days, 90 days, 6 months and first year. Do not hire a leader without onboarding and assimilating them properly into your organization. If you don’t, the leader could easily become another negative statistic. By investing properly in a new hire’s onboarding experience you are increasing their odds of being wildly successful in your environment. You will maximize their ability to gain trust, build relationships and create results. You will be improving their career success and career fulfillment. Blow people away (BPA) by providing a best-of-class onboarding experience. Consider it insurance on your investment. Your onboarding strategy should be built and in place prior to talent even interacting with your organization. Every step of the applicant’s interviewing and hiring process is an indication of what their working experience will be like. 5. Let “TIP” lead your approach to employee onboarding, development and retention. Becoming a Talent Magnet is about taking a thoughtful, intentional and personal approach to your corporate culture, employment branding and the full employee life cycle. Ensure your organization is conducting open and meaningful conversations. Create a culture where “Stay Interviews” are a standard part of an employee experience. Create a culture where communications are expected, timely and transparent … An environment where confrontation is seen as a necessary part of building a cohesive and high performing team … A safe place to ask, listen and learn. I recently had an experience where I sat next to a team member that I had not yet met from one of our client companies. I asked him how he has enjoyed his employment with our client. His response, “This is the safest and most productive culture I have ever been in. I can focus on doing my best work. I know my boss and his boss both have my back. I have never worked for a company quite like this.” I sat there– emotionally choked up. The people he referenced, the manager he worked for and the leaders he said contributed to this, were all leaders we had placed. He was with a company that has a courageous CEO. A client who I am honored to call a great friend. A client who calls us a champion for his business. A culture and leadership team who is all in for their employees can have this type of impact on their people. This is what being a talent magnet is all about. Think about becoming one. We can help you get there–beginning today. 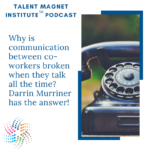 Subscribe to our Talent Magnet Institute podcast to learn more and subscribe. Available on iTunes & Apple Podcasts, Spotify and all other major podcast applications. You can also ask Alexa, “Alexa play the Talent Magnet Institute Podcast. What is Talent Strategy – Why Should You Care? We empower organizations to plan, hire, retain and grow. We partner with growth-minded organizations to build and develop vibrant leadership teams. For over 40 years leaders have trusted Centennial to deliver results and value to their organizations. © 2005-2019 Centennial. All Rights Reserved. Leadership & Talent should be your #1 priority! Sign up for insights from Centennial.